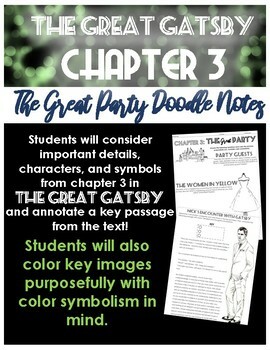 Students will take purposeful notes as they read (or even listen to the audio of) chapter 3. 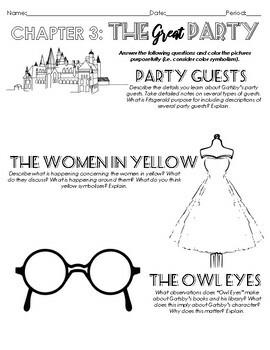 They will consider Fitzgerald's greater meaning and purpose relating to the party guests, women in yellow dresses, owl eyes, and Nick's encounter with Gatsby. Have students color in the provided pictures purposefully with color symbolism in mind! 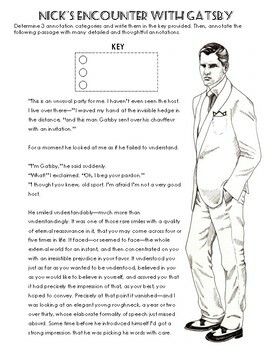 Students will also closely read and annotate a section from the chapter. They will determine 3 main categories for their annotations (characterization, word choice, etc.) with a provided key to help them color code their annotations. This helps students choose literary elements that are most important to look for in light of the details provided in the passage!